Group 2 - who are interested in the recipe only. Group 3 - they only check the pictures. Group 4 - they are the silent visitors. I distinguish these groups by the comments they post on the blog. It's the way I perceived. You may not concur with my findings. Couple of weeks ago one of my friends told me that her daily lunch time reading includes posts from my blog, but I never knew it...I was in cloud 9 when I heard that. So there are visitors who are regular readers of blog but never pens anything, but supports you. Anyway I love to hear from you, so that I can improve and learn from you. Your valid comments are suggestions are the backbone of this blog. So please don't hesitate to comment when you want to say something about the post. I guess you can decide in which group you belong now :). My hubby's suggestion was to not make short posts, but I guess it depends on individuals. To me, it's different. I have an array of food blogs I visit regularly during my lunch time. I find these sites as a means of connecting to writer and knowing more about them. The more you read, you feel he/she is your next door neighbor. Some blogs has the mesmerizing power that you would never like to miss a post. Don't you agree? 'That's enough Philosophy Shibi'...my innate impulse reminded me. Cook the sphegetti according to the package direction and keep it aside. Mix together the ingredients for Lo Mein sauce together in a non reactive bowl and keep it aside. Use a wok or non-stick pan and lightly brown the chopped garlic and 1/2 tsp of chili flakes in 1 tbsp of Sesame Oil. Add the White onions and stir for 1 minute. Add carrots and broccoli and stir fry for couple minutes by coverig the wok for 1 minute. Don't over cook the vegetables. Add 2 tbsp of the mixed Lo Mein sauce and mix well and transfer the vegetables to another dish. In the same wok, add 2 tsp of Sesame oil and cook the chopped garlic, followed by ginger till light golden brown. Add chili flakes, pepper powder and roast for another minute. Add the chicken and season with salt and 2 tbsp of Lo Mein sauce and cook covered till the water dries up and the chicken is all cooked well. Now gently add the cooked noodles to the chicken and mix well. Add the remaining Lo Mein Sauce to the noodles and chicken and mix well. Now carefully add the vegetables and mix. Drizzle 2 tsp Sesame Oil. Cook on low heat for 2 minutes and turn off the flame. Lo Mein is ready to serve. 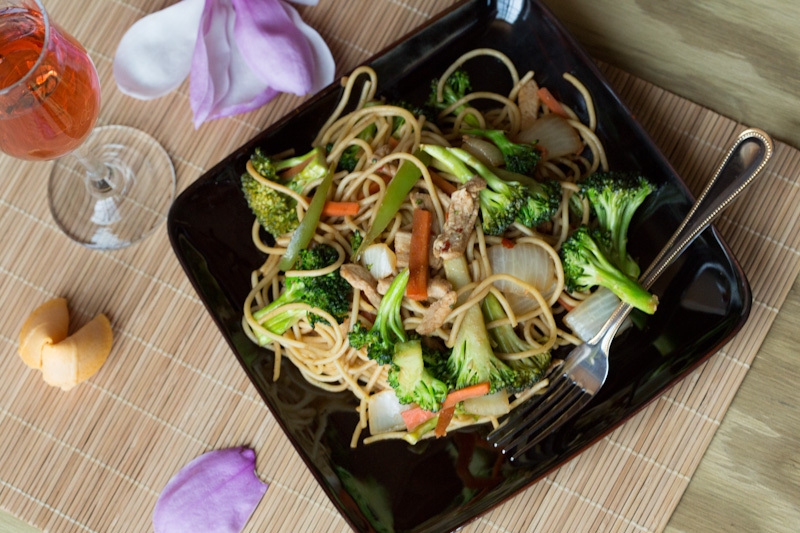 You can use vegetables and meat of your choice in Lo Mein. Shredded cabbage, bok choy, mushrooms, bean sprouts etc can also be used. 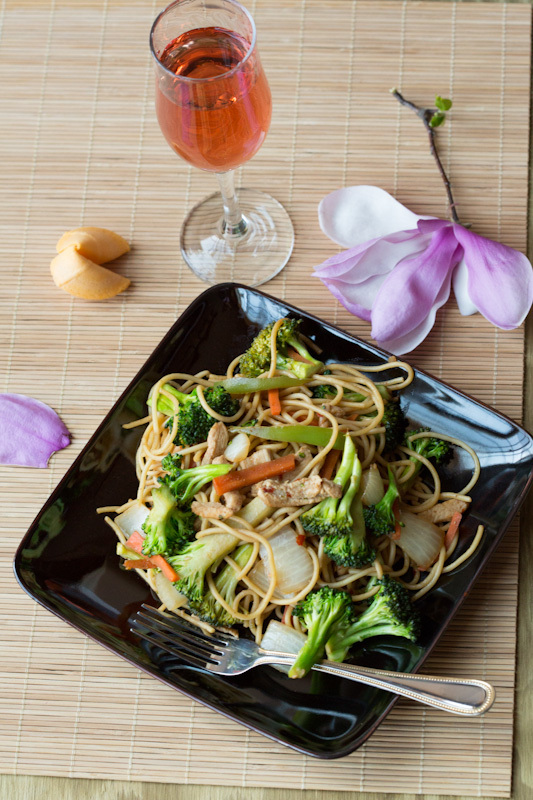 Adjust the Lo Mein sauce and pepper flakes according to your taste. Soy sauce and Hoisin sauce are already salty, so be cautious when adding salt. I agree with what you have said...its is actually very true because I also have a huge list of blogs which I visit regularly- some for their recipes, some for their photos and some for both. I am one of those who visits blogs for few reasons. I like to be connected to fellow bloggers, does not matter what they blog on, I like to read and discover new issues, opinions and recipes. I think its great to have cyber friends who enjoy blogging though sometimes it can be stressful too. Btw, this noodles remains me of the many similar varieties we have over here. That said, its a new version for me and interesting one too. Yet never heard of lo mein sauce before. Actually there is no sauce named 'Lo Mein Sauce'. Since its a blend of few sauces, its just my interpretation and naming convention hehe.. I think a lot of people who read blogs on a regular basis don't comment. It's always nice to get feedback from the comments, though. Anyway, nice post! I love lo mien. But then, I like any kind of pasta, or pasta-like dish. This looks wonderful. Good recipe, good pictures, and good commentary! Thanks so much. perfect classifiaction of blog visitors !! and lovely noodle too ! cud just take the whole plate off the screen. and Shibi..do drop by my quick picks when u get the time..got something which wud be of interest to u. And we had noodles yest :-) instant maagi types and was so yummy...i only added sliced onions n carrots. Appu gulped it down though it was a bit spicy. Thanks Manju for the sweet comment!!! Thats a very good write up Shibhi...You know which category I belong too and I too know which category u belong too when u leave comments on my blog.I dont blog hop much but when I do I read what they write :) The only noodles I make is maggie noddles..but love eating it in chinese restaurants and all..this looks yumm ! Vineetha, I know very well in which group you belong :)...friends like you are a great inspiration and support for me!!! Looks very colorful and appetizing!